Kodachadri ranges in the state of Karnataka are one of the most beautiful places of Southern India. Every year thousands of trekkers, backpackers, nature lovers and photographers flock this place to admire the scenic scapes of the Western Ghats. At the peak ( atltitude 1343m ), the sunset and sunrise are considered to be not-to-be-missed life time opportunity. It is a time where the monsoon rains have stopped and the lush green tropical rains forests of the Western Ghats are buzzing with lots of bird activity. Winter migrants flock the place and it’s heavens for birders and bird photographers. Situated in the middle of the Mookambika wildlife sanctuary, it is home to several endemic and endangered species of flora and fauna. I recently had the opportunity to spend two days in the Kodachadris. 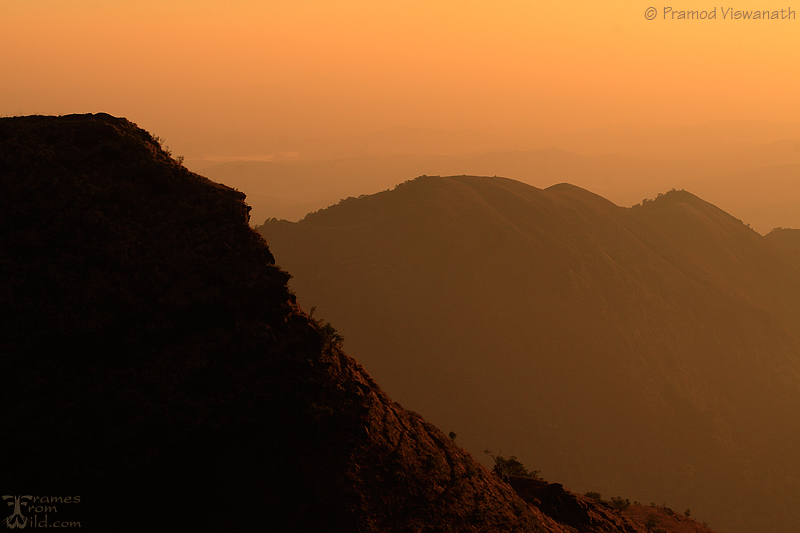 Nestled in the western ghats, the area is a nature photographer’s dream. Be it for landscapes and birds in winter or macros during the monsoon, you can make beautiful images here. There are different routes through which one can trek to this place. One is from the Sampekatte side and other is from the Kaareghati side. Another alternative plan to reach the peak is through Jeep travel. People who cannot trek and still want to enjoy the scenic sunrise and sunset can hire a jeep from Kollur – another small town famous of Mookambika temple. On a clear day, shimmer of Sharavathi river back waters towards east and shimmer of Arabian sea waters towards west are a treat to watch. If you are starting your trek from kareghati side, the initial forest patch is excellent for bird watching. Lush green all around, tall tropical trees adorned with endemic birds and malabar giant squirrels are life time experience in itself. After about 3 KM of walk we reach a place where we find a small hotel or a tea shop which is the last human habitation where one can get some food until we hit the deck, beat the heat and reach “Bhatru mane” ( Bhat’s place where we can get some accommodation ). This place is flocked with hikers and trekkers are through the year but in winter it reaches the maximum. There are couple of waterfalls in the region – Hidlumane falls and Arisinagundi falls. Trekking this place to reach either of the falls is quite an experience in itself. The last time I trekked, I made it to Hidlumane falls. The terrain is steep and tough at times. As we descend down the kodachadri summit along the Jeep track for a distance of about 2-3 kilometers, we hit upon a patch of grasslands where we need to take a deviation to reach the place. At times, close to the falls, there is literally no hiking path and we need to take the tree stumps and roots as aid to reach the base of the falls. If you are a serious landscape photographer wide-angle lenses and zoom lenses with shorter focal length are a must. If you plan to trek during the rainy season, as a macro photographer, a macro lens to supplement the wide angle would fetch you a gold mine. Weather protective accessories are a must to protect your equipment from heavy rains. If you plan to isolate few regions of the landscape then it will be a backbreaking trek to carry a longer focal length lens. A circular polariser for your wide-angle lens will be extremely helpful if the sky is very clear to darken the skies a bit. A neutral density filter will help you tone down the lighter skies during dawn. Backpacking: Apart from the usual hiking gear, if you are a team of hikers carry loads of water, energy bars, of course team spirit and sense of humor are mandatory! Cell phone is a must to keep in touch with your loved ones. Trekking during monsoon: Trekking during monsoon will be extremely challenging considering the incessant rains and lots of leeches. Even the leech proof socks might not be helpful! Accomodation: Apart from the Bhat’s place there is also a Public Works Department’s (PWD) guest house next to the Bhat’s place. You also have an option of staying here. If you intend to sleep under the sky, carrying your own tents will be icing on the cake for the trip. Do’s: Take lots of memories and pictures. Enjoy your trek. Maintain silence. Dont’s: Do not litter. Do not shout or make noise. Do not play loud music – remember you are on a trek and maintain the sanctity of being one among nature. Thanks a lot for sharing your wonderful experience. We are planning in to be there in mid of August. Is it a right time. Excellent Photographs thanks for all the info. Thanks for sharing the tips. We, a team of three are planning for a trip on November, 2012.